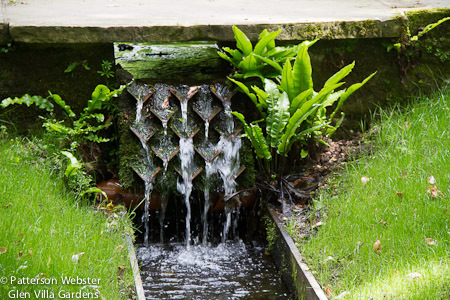 Water features are an important element in many gardens. Understandably so. Water can reflect the sky, enlarging the space to infinity; it can reflect surrounding buildings or trees, adding stimulating contrasts. It is an ideal environment for certain decorative plants. It cools the air and its movement over rocks or cascades adds a refreshing note. that carries water from one place to another. 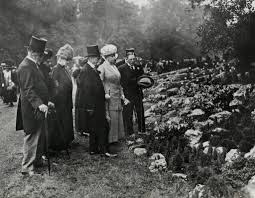 Historically rills developed from the religious ideas of Persian paradise gardens. They appeared later in Europe, in Moorish gardens like the Alhambra in Granada. Traditionally these rills were straight and flush with ground level, but in more modern times, things have changed. Rills now curve with the contours of the land or to follow Hogarth’s Line of Beauty. They are narrow or wide, flush with ground level or raised in the air. 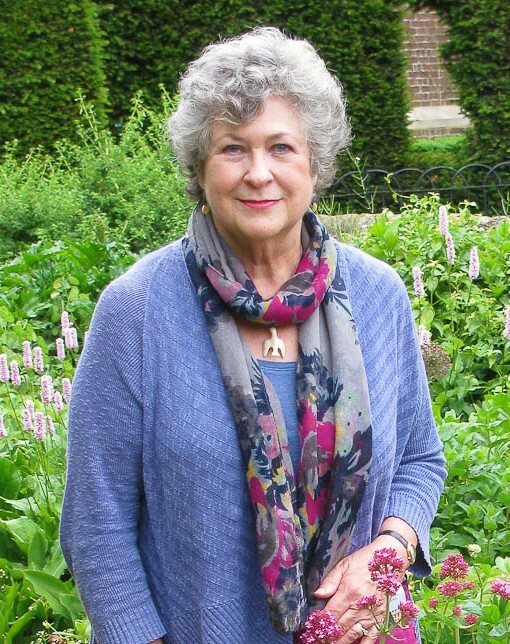 At Westbury Court, a National Trust property in England, the rill is wide. Water is contained within a straight-edged canal, making it clear that man, and not nature, is in control. 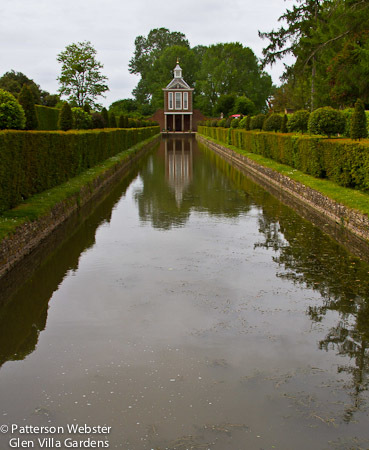 The 17th summerhouse is reflected in the canal at Westbury Court in Gloucestershire. 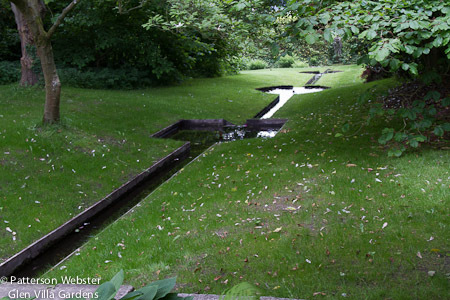 Twentieth century gardens frequently treat water in a similar way, and for similar reasons. At The Grove, garden of the interior decorator David Hicks, it is hard to imagine anyone actually using the body of water that is called a swimming pool. Its primary purpose is to show that the designer is in charge. Almost incidentally the pool introduces the line of trees that extends into the distance, and invites the eye to travel outwards through the world Hicks shaped. The straight-line pool is said to be for swimming. 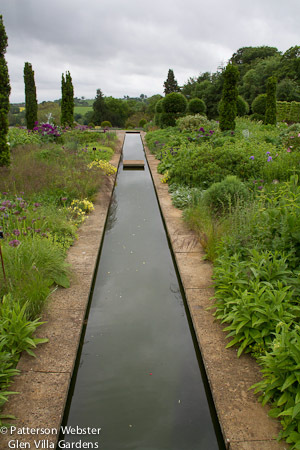 At Broughton Grange, landscape architect Tom Stuart-Smith divided the upper terrace with a canalized stream, or rill. This narrow path of water offers a resting place for the eye in an intensively planted area. A stepping stone gives easy access from one side of the rill to the other. 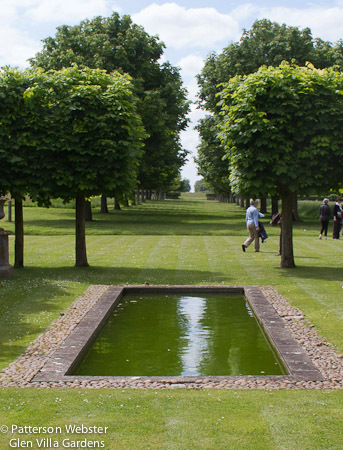 The rill at Broughton Grange stretches towards the horizon. Whether straight or curved, rills are my favourite way to transport water from one place to another. 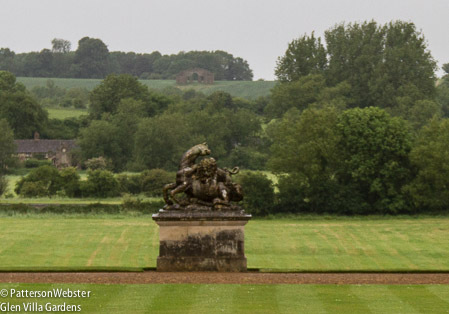 Edward Lutyens was a master at this as Hestercombe, his 1906 garden in Somerset, demonstrates. 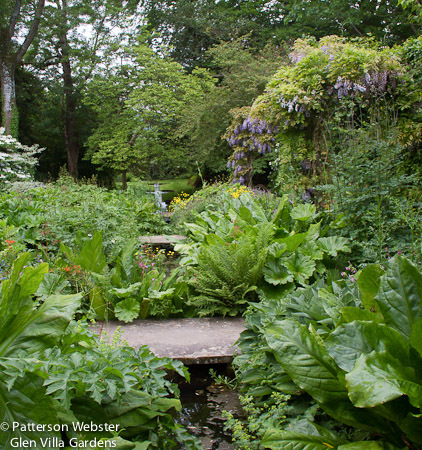 Planted with iris, calla and water lilies, his rill on the Great Plat refers glancingly to the Dutch canals that preceded it, at Westbury Court and similar places, but remains wholly itself, a testament to Lutyens’ skill in re-interpreting old forms. 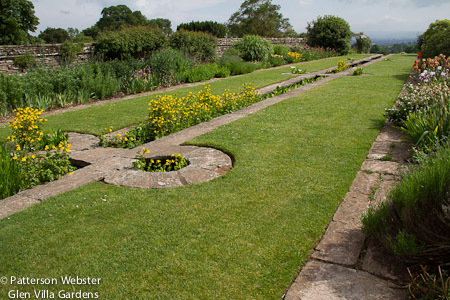 Lutyens broke up the straight line of the rill with small stone-edged circles. Circular forms appear in many other places on The Great Plat and elsewhere in the garden. 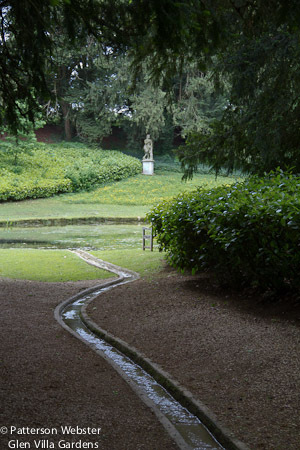 At the magnificent 18th century garden, Rousham, the rill curves through a dark wood. Following the water line, I felt like I was entering a realm of mystery and intrigue where anything might happen. The rill at Rousham channels water to an octagonal pool called The Cold Bath. The rill enters a shady wood at the top of a slight rise. Midway along its path it reaches The Cold Bath, Rousham’s heart of darkness. Beyond, in the distance, water in an octagonal pond shines in the sunlight, beckoning the visitor onwards. But illicit adventure still calls: overlooking the pond is a statue of a satyric Pan, playing his pipes. A statue of Pan promises Arcadian pleasures in a sunny glade. 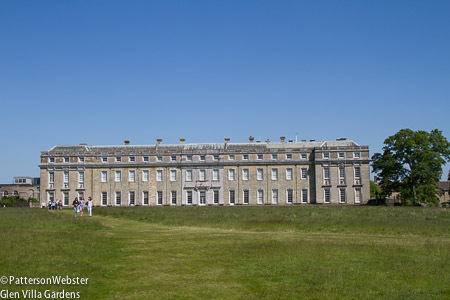 For magnificence, few rills can surpass the one at Shute House in Dorset. 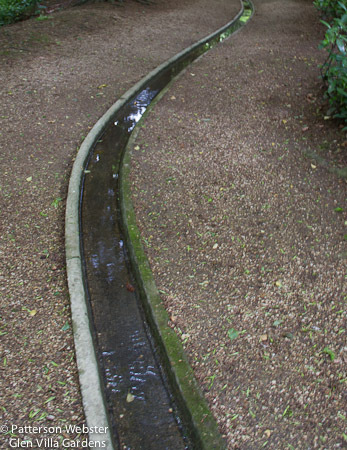 Designed by Sir Geoffrey Jellicoe in the late 1960s, this rill combines three fundamental geometric forms to create a 20th century masterpiece. Water starts its way down a gentle slope through a garden bursting with exuberance. Stone slabs bridging the rill break up plantings so lush they almost hide the water. Lush plantings almost hide the top level of the rill at Shute House. Below the planted area, the rill enters a calm grassy space. Here the straight line begins to vary, from square to octagonal to round. The shapes are ordered as if the water itself had softened the forms and smoothed out the sharp edges. Looking down the rill at Shute House. This is no ordinary rill. The sound of the water changes as it falls from one level to the next. 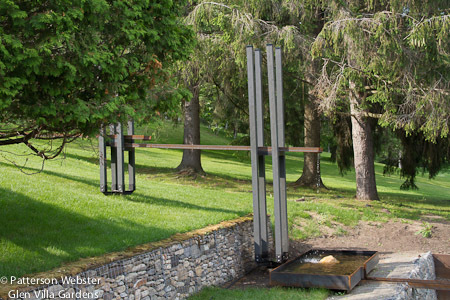 Sir Geoffrey achieved this by using copper spouts that are ‘tuned’ to different pitches at each level, so the sound becomes softer and more melodious as the water descends. Copper spouts divide the water to soften its sound. The rill at Shute House was inspirational. Many blog posts ago, in an entry called The Sound of Summer, I wrote about water in the garden and how I missed the music of the stream beside our old cottage. I’ve been working for over a year now to bring that music back into the garden and into my life. I’m calling the project The Aquaduct. The photo below shows why. My musical rill is elevated. Like its Roman predecessors, The Aquaduct carries water from the hills to another place. At Glen Villa, this is from the fields above the house down to the lake. Near the house and a deck where we often eat, the water pauses and spreads out into a reflecting pool that will, eventually, give the window to infinity that adds depth and meaning to a garden. The Aquaduct is the biggest project we’ve undertaken at Glen Villa since our initial renovations fifteen years ago. It hasn’t been without its problems. These problems continue, but they are minor in comparison with the pleasure of once again hearing the sound of summer I’ve been missing. I’ll write more about The Aquaduct in the weeks to come.